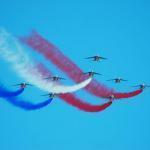 PARIS AIR SHOW 2009 – Wonderful ! Thanks to Nicolas (www.frogetech-blog.com webmaster) who invited me, I went to the Paris Air Show on Saturday June 20th 2009. I had already attended many meetings, aircraft and blimp presentations, air shows, and exhibitions but it was the first time I had visited the famous Paris Air Show. It was not scheduled, and on the one hand, a little time before the opening, I hesitated a bit for it was a pretty long trip. On the other hand, I thought it was a very good idea to join a few members of the Aero Frogetech social network but it was a little late at that time, therefore there were only two of us. I learnt only three days before that the aircraft list looked a bit poor since there weren’t any 5th generation fighters announced since the F-22 Raptor presentation – a highlight – was cancelled. As a matter of fact, I was a bit disappointed, actually. At least, frogE-TECH and Prepa PLS Anglais could meet there, which was a highlight indeed! We entered the Salon du Bourget just after enjoying meeting with each other for the first time. I realised that I shouldn’t be listless by the aircraft list for I discovered – though it wasn’t expected – a 7th-wing Jaguar on the spot as soon as we were about to walk into the halls. Then, everything turned out to be wonderful, and as interesting as ever. from « blade » and « disk ». We learnt interesting information from various exhibitors however flocks of crowd sometimes jammed the paths to the stands, and we got a bit reluctant to remain in front of the brand new engines exhibited at times. medium/small-sized cargo aircraft that well showed how maneuverable it was, really. We then enjoyed the new US DoD fighters’ aerobatics. The F-18 performed magic tricks at low speed and the F-16 turned out to be swifter than usual but it might just be the impression we had. Airbus A380 took off along a quite steep path. One might wonder how a so heavy cargo manages to lift this way. Its low speed passages let everybody dumbfounded, and it undoubtedly deserves its airworthiness certification considering the tight turns it performed. Watching this huge cargo – a freak far bigger than a whale – flying so slow, then so swift was unbelievable. We appreciated visiting many stands and taking snapshots of the new Piaggio, a Dakota, rockets, and the F-35 LIGHTNING II !!! Then, we were told that it only was a full-scale model. We couldn’t approach the French Air Force stand for cameramen and people gathered on the spot as the head of the French Air Force, general Abrial was about to welcome the French president. Everywhere we noticed that « low-consumption and environment-respectful » came as a motto. Nowadays, many aircraft are designed with winglets even on the tail units. 3D-woven fan structures save weight, and enhancements allow airlines to save long-term money as well even if some investments seem quite considerable. Reducing noise looked like an obsession as we could see many jagged exhaust nozzles. Upon assessing the streamlining we guessed that most aircraft are not dedicated to supersonic use anymore as if lowering kerosene consumption was crucial… and that is! At the end of the show, it was easy to buy the rest of the magazines or souvenirs as they were sold cheaper. We couldn’t regret our coming and the light showers didn’t bother us at all because we were fascinated by the show all the time. Far and large, this Paris Air Show will remain in our memories as a must where we could discover and learn as much as we liked. By the way, I do think that this show, dedicated to its 100th anniversary was made on this purpose: aeronautics passion, and I dare say « as usual ». I think I will write an article later about an amazing engine we found there and a French ambitious team willing to use it in order to win the Reno race in 2010. Dear readers, I wish you a very good night, thank you very much Nicolas for your invitation, thank you very much indeed.